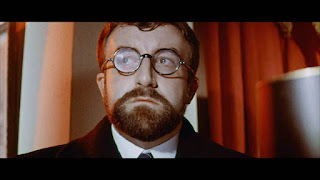 Already a huge comedy star at home but not yet the international movie star he would become, Peter Sellers made his debut as a feature director with this deliciously dark comedy, from a play by Marcel Pagnol. Mr Topaze teams him with his Ladykillers and Pink Panther series co-star Herbert Lom in a cast that also features Billie Whitelaw, Leo McKern, John le Mesurier and Joan Sims. Sellers masterfully plays Topaze, a mild-mannered school teacher who metamorphoses into a chillingly cutthroat businessman. Dubbed at the time “an enchanting comedy” with a “witty script, crazy characters and fantastic story”, the film was more recently acclaimed by Sellers' biographer Roger Lewis as a "lost classic". Using the only known surviving prints, held in its own collections (including Peter Sellers’ personal copy on 16mm acquired in 1997), the BFI National Archive has produced a painstakingly cleaned-up digital version so that Mr Topaze can be made accessible to the public via its VOD platform, BFI Player. The film is the highlight of an intriguing new collection entitled Forgotten Features, released last Thursday, which presents a fascinating selection of British films that have undeservedly disappeared from public view. Mr. Topaze is FREE to view today, Monday 2 May (pay per view after that date). Forgotten Features is a rich collection of 50 British films which have unfairly fallen off the cultural radar. Hand-picked from the vaults by expert curators from the BFI National Archive and Regional and National Archives , the films range from the 1920s to the 90s and include rarities unseen by even the most ardent film fan. Bless ‘Em All (1948) Much-loved light entertainer Max Bygraves made his film debut in this cheerfully old-school slapstick army comedy. Long considered Missing in Action, until a print was discovered in Belgium. Symptoms (dir. José R. Larraz, 1974) This atmospheric horror thriller was Britain's entry to Cannes in 1974, but only a few home-taped VHS copies were known to survive. Symptoms was one of the BFI's top ten ‘Most Wanted’ films, until the negative was tracked down by curators. Now, after a painstaking digital clean-up, its reputation as a lost genre classic is confirmed. They Came to a City (dir. Basil Dearden, 1944) Utopian vision or 'socialist propaganda'? This one-of-a-kind wartime fantasy, written by JB Priestley, follows nine characters arriving at a mysterious city and responding with delight or horror to what they find there. Long hard to see but recently remastered by the BFI, it's one of the strangest films from the glory years of Ealing Studios. The Silent Playground (dir. Stanley Goulder, 1963) In this unusual and affecting drama set around South London, a learning disabled man unwittingly poisons children with prescription drugs he thinks are sweets. A fascinating, sometimes progressive period piece, The Silent Playground revealingly reflects 1960s attitudes to both learning disability and mental illness. Desmond Llewellyn - best known as Bond boffin Q - appears as a noble doctor. Wild West (dir. David Attwood, 1992) The first Asian-British honky-tonk comedy! Zaf (Naveen Andrews) defies his conservative Pakistani family to become Southall's first Country & Western star. This amiable, energetic comedy arrived a little too far ahead of the late-90s Asian boom (led by Bend it Like Beckham and East is East) to find its audience, and well deserves a second chance.